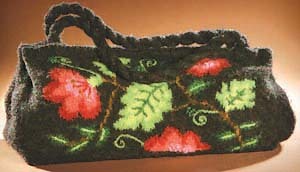 This felted handbag is knit using Jamieson's Double Knitting 100% wool yarn. It is from the book Fabulous Felted Bags by Nicky Epstein and yarn kits are detailed below. Note that a larger version of the bag design can be viewed by clicking on the picture to the left. Purse hardware available from Bag Boutique or Sunbelt Fasteners. The pattern is not included in the kit but is in the Fabulous Felted Bags book (pictured at right) which can be ordered separately. This book includes full instructions for this bag as well as 14 other designs and is priced at $27.95 CDN ($20.95 US). To order the book simply specify it as a separate line item on your order form. We provide free colour sample cards for all the yarns we offer. Click Here for the order form for these as well as our knitting catalog.